Biggar Gasworks is a remarkable survivor. Standing beside the Biggar Burn on Gas Works Road, which runs north from the western end of Biggar High Street, it is Scotland's last remaining plant in which town gas was produced from coal. Gas was first produced from coal in 1792 by William Murdoch, a native of Cumnock in Ayrshire who at the time was working for Boulton & Watt in England. He initially produced enough gas to light a single room at his house in Redruth in Cornwall, and by 1798 he had installed an experimental gas lighting system in the Boulton & Watt works in Birmingham. Within a few years, Boulton & Watt were selling entire gas lighting systems to cotton mills, where the combination of lighting by candles and oil from the cotton had led to many fires. 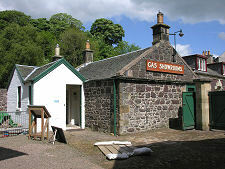 Gas production in Biggar began in 1839 with the establishment of the Biggar Gas Light Company. 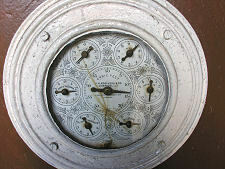 A gas making plant was purchased for £247 from the Glasgow company Robertson & Wilson. 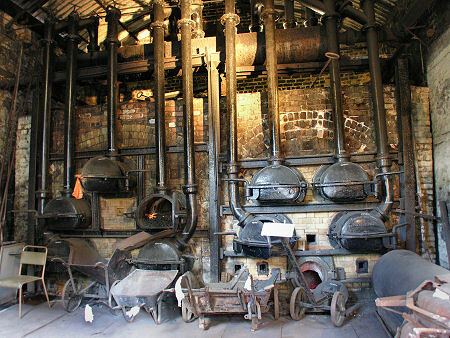 Gas supply began on 14 October 1839. 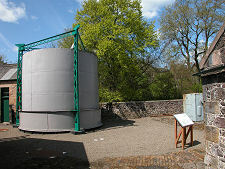 By 1858 demand for gas in Biggar was running ahead of the company's ability to supply it, and a second, larger, gasholder was built. 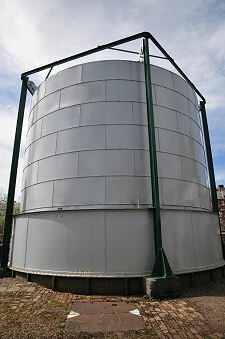 In 1879 a still larger gasholder was needed, which replace the one originally constructed in 1839. The gasholders you can still see at Biggar today are those from 1858 and 1879, though both were altered at various times during the life of the gasworks. A major change came in 1914 with the building of what was virtually a wholly new gasworks. This included the erection of a new retort house and many other changes. 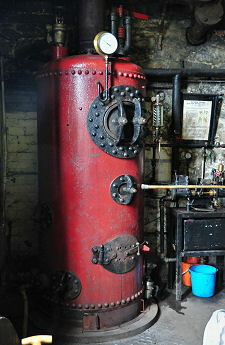 The gasworks you see at Biggar today is very much what emerged from the building work in 1914. 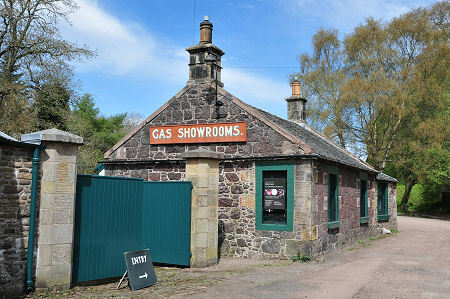 Gas continued to be produced by the Biggar Gas Light Company until the industry was nationalised in 1949. With the realisation that the UK had natural gas reserves under the North Sea, the decision was taken in 1966 to gradually replace town gas supplies with natural gas. 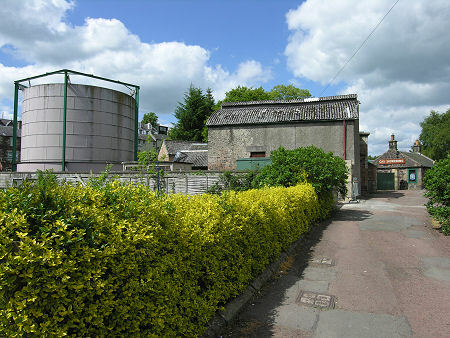 Biggar continued to rely on town gas until late in the changeover, and Biggar Gasworks only ceased production on 4 January 1973. By this time efforts were being made to find a suitable Scottish gasworks to preserve as a reminder of an industry that might otherwise be completely forgotten, and Biggar Gasworks was chosen because of its manageable size and convenient location. 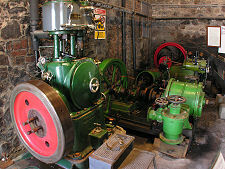 The gasworks was therefore placed in state care, and today it is looked after by Historic Environment Scotland. 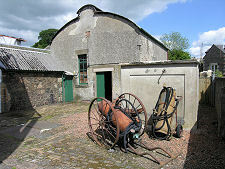 On a day to day basis, the museum is administered by the Biggar Museums Trust, who also run the Biggar & Upper Clydesdale Museum in the village. As you walk along Gas Works Road from the High Street in this highly attractive part of Biggar, the gasholders and other buildings of the gasworks come into view, apparently set among residential back gardens. It is difficult to imagine a more unlikely location for such an industrial process, and even more difficult to believe that the gasworks was still in operation until less that 50 years ago. 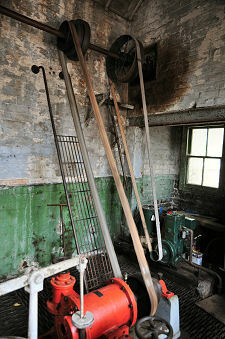 Within the gasworks you get an excellent idea of the various processes required to produce gas. 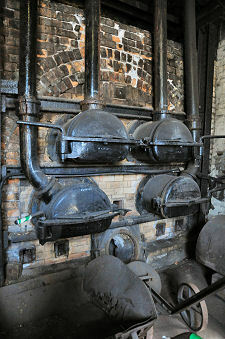 Coal was heated in closed containers called retorts. 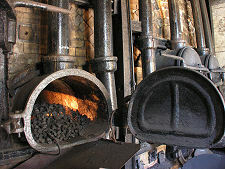 This drove off the various gases within the coal and left coke, which could then be burned to heat the next batch of coal. The gases produced by heating coal included hydrogen, carbon monoxide and methane, which were wanted as components of the town gas that was then piped to users, as well unwanted components such as other hydrocarbons, tar, sulphur and ammonia. A large part of the process involved separating the unwanted components from the town gas: they could then be sold for use in other chemical processes. 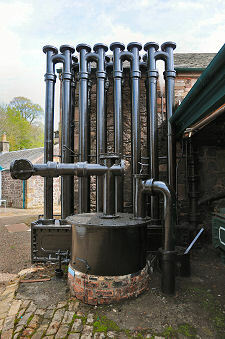 It is worth looking out for the museum's "steam days", when the boiler is fired up and steam-driven machinery is put into action.